I honestly don't know if its just me, but May has definitely flown over, yet at the same time feels like its dragged and payday couldn't have come quick enough. Bar the occasional Primark splurge I'm really feeling like I'm trying to invest my money (this is my excuse) in key pieces, which will come in handy considering I'm literally on the verge of buying a house (and its IMATS next month). I've decided recently I've spent more than enough money on shoes, and I think its time for one last designer handbag splurge, say hello to the Vivienne Westwood (or Viv as she will be known as). She's a beaut isn't she? Next up is a white tee - which believe it or not I don't own. Considering I can't find one in the Topshop tall range anywhere in the North East I'm hoping that I can track one down in Oxford Circus. Or if any of you know where I can find a long white tee let me know. Finally the skirt - I'm absolutely obsessing over Aussie brand Finders Keepers at the moment, probably egged on by the fact that its nor readily available in the UK. Now this skirt is pricey at £90 but how bloody gorgeous (and summery) is it?? I need this for a night out, desperately need it. You know i'm going to end up buying it and being brassic for the rest of the month. First world problems at its finest. Finders Keepers are amazingggggg. They're one of my all-time favourite brands. I would absolutely say keep your eyes on Harvey Nics and ASOS, they sometimes have amazing sales on the brand. I say sometimes, it's actually quite often. They're such a gorgeous brand and the skirt is so totally worth it. I wear my stuff all the time, I got my prom dress from there! They're so cute. 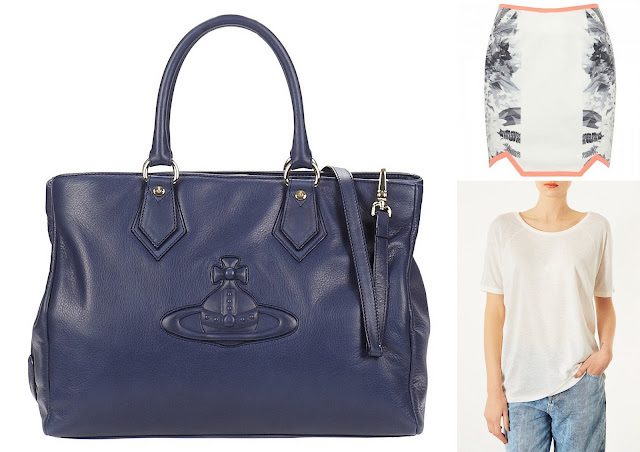 That Vivian Westwood bag is amaze!